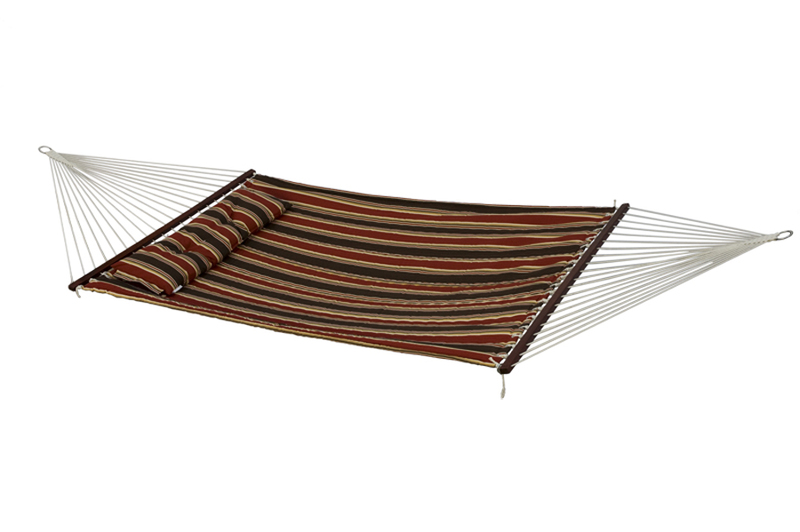 Beautiful Bliss brown striped quilted hammock with stripes of dark brown, black, with pinstripes of red, green, and white. The soft cotton, quilted fabric is UV treated for more vibrant colors that last. Enjoy the button tufted pillow that will never fall off as you are getting comfortable. *Solid non-decaying hardwood spreader bars with mahogany marine varnish. *Mildew and rot resistant soft polyester rope. *Bed size: 6’ 8” long x 55” wide Overall length: 13’ . *Included hard ware is made with hot-dipped, galvanized, heavy gauge steel, to resist rust. *Hardware included: 2 “S” hooks and foot long chains.